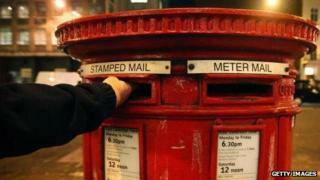 Royal Mail shares are to be sold by mid-October, before postal workers have a chance to strike over the move. The company is valued at £2.6bn to £3.3bn, the government said on Friday. The Department for Business said Royal Mail would list on the London Stock Exchange next month. BBC business editor Robert Peston says that the privatisation should be complete by 15 October. Postal workers will on Friday begin voting on whether to take industrial action to oppose the plan. In a statement, the government said that 10% of the shares, priced between 260p and 330p, would be given to about 150,000 "eligible UK-based Royal Mail employees". The government will also sell between 40.1% and 52.2% of the Royal Mail under its privatisation proposal. Members of the public can apply for Royal Mail shares online until 8 October. Shares will begin trading in full on 15 October. The minimum application for the public wishing to purchase shares is £750, or £500 for eligible Royal Mail employees. The government said it might also sell an additional 15% of its stake in what is called an "over-allotment" option, if the demand for shares was very high. Business Secretary Vince Cable said: "This will give Royal Mail access to the private capital it needs to modernise, as envisaged under successive governments and enshrined in law by Parliament two years ago. " Moya Greene, chief executive of Royal Mail, said that the company would "not change". "We will now be better able to compete in what is a fast changing and intensely competitive market," she added. 1512 - In February the first 'Master of the Posts', Brian Tuke, is appointed by Cardinal Wolsey, then chancellor to a young Henry VIII. 1635 - A postal service is made available to the public, with the cost being paid by the recipient. The fee is determined by the distance the letter travelled and the number of sheets. 1986 - The Post Office's functions are split into Royal Mail Letters, Parcels and Counters. 2001 - The Post Office Group was temporarily renamed Consignia at a cost of £2 million. 15 months later it returned to using Royal Mail. 2006 - Postcomm, the regulator at the time, opens the postal market to outside competition. 2010 - The government announces its plan to sell the delivery arm of the Royal Mail. The CWU on Friday in statement said it "criticised" the government for pressing ahead with what it called an "unpopular" privatisation. CWU general secretary Billy Hayes said: "It seems remarkable that the prospectus is being issued on the same day that postal workers are being sent ballot papers for strike action." Mr Hayes added: "Royal Mail is profitable and can continue to be successful in the public sector. The sale is driven by political dogma, not economic necessity, and postal workers and the CWU will continue to fight to save services as well as defend their terms and conditions." Voting in the strike ballot will close on 16 October. The earliest a strike could take place is 23 October. In the official prospectus for the share issuing, the Royal Mail warned that industrial action posed a potential risk for the share price. The statement said: "National industrial action, or the threat of national industrial action... could also have a material adverse effect on the success of the offer and, if it occurs after admission, could cause the price of ordinary shares to fall significantly." Business minister Michael Fallon told the BBC that the six-day-a-week delivery, or "universal service", was "completely protected," but private investment would help the Royal Mail improve that service. "It's a business that needs access to private capital," he added. Media captionBusiness minister Michael Fallon: "This is a huge day for Royal Mail"
Postal economist David Stubbs told the BBC that the pricing of the shares was "low". "Under some scenarios, this looks cheap. If the Royal Mail is able to keep its market share and to keep its industrial relations issues under control, then this pricing is low. "It looks like the price reflects the government's desire for a quick sale." Mr Stubbs added, however, that if there were continuing problems with its labour relations, and if competitors began to gain an advantage, the value would be less than the range given by the government on Friday. The shadow business secretary, Chuka Umunna, said there was no good reason to take the business private: "Having nationalised Royal Mail's debts by taking on its pensions liability, Ministers are privatising the business when it is making over £400m in profits, which makes no sense."